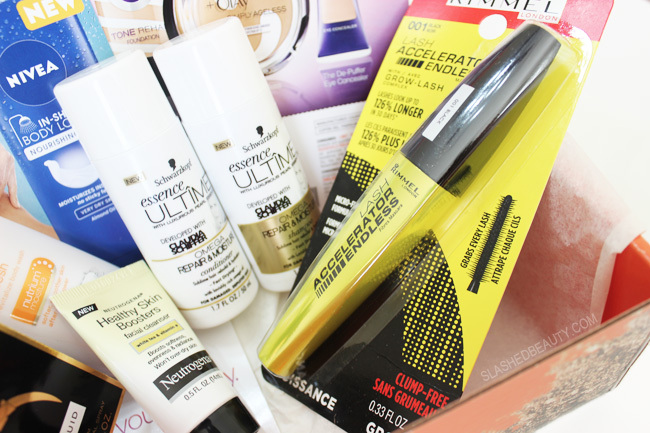 It looks like the spring 2015 Walmart Beauty Boxes are rolling out! In case you’re unfamiliar, the Walmart Beauty Box is a FREE subscription box (with $5 shipping so… free-ish) that sends you the hottest and newest drugstore beauty finds seasonally. The last couple boxes have sent some really neat products, so I was excited to see what was in store for spring. There are always two versions of this box, and I’ve luckily always gotten what I consider the “good” box. Even though we only got one full size product this box, I was actually sort of thankful to receive some deluxe samples. Since I’m traveling for Spring Break for a week, I needed a travel size of literally everything. First off, I got a full size Rimmel Lash Accelerator Endless Mascara— score! This is supposed to lengthen the lashes like crazy with its micro-fiber formula, and has a dense brush comb to avoid clumps. It claims that it is contact wearer and sensitive eyes friendly, despite being a fiber mascara. Apparently it has a GROW LASH complex to actually help grow the lashes to look longer without mascara, too. The Essence Ultime hair care line from Schwarzkopf is new to Walmart, and we got travel sizes of the Omega Repair & Moisture shampoo and conditioner. This is specifically for damaged and dry hair, nourishing with rich omega oil. It smells sweet and fresh, so I was happy to throw this in my bag for my trip. It can be hard to find travel sized hair care that is specifically for dry hair, so I was down with this sample! 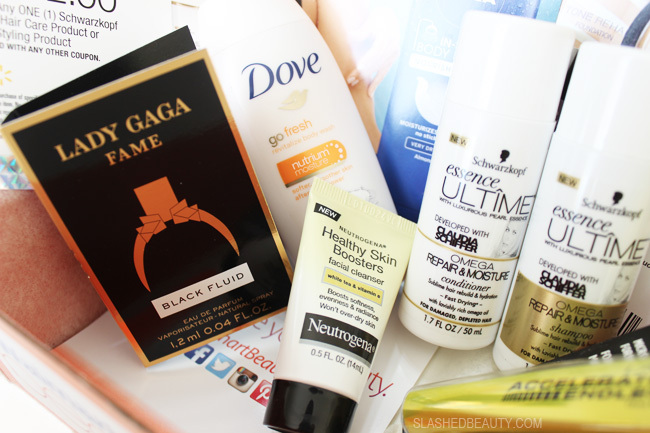 The other, smaller samples included Neutrogena’s Healthy Skin Boosters Facial Cleanser, the Dove GoFresh Revitalize Body Wash (which smells like a delicious orange creamsicle), and sample spray vial of Lady Gaga’s new Fame fragrance: Black Fluid (which smells sort of like patchouli). On top of the actual products, Walmart outdid themselves by sending $14 worth of beauty coupons from brands like Rimmel, L’Oreal, Nivea, Garnier, Maybelline, and CoverGirl. If I weren’t traveling, I might have been a little more disappointed in getting mostly small samples, but the cost of the mascara is already more than the box itself, so there’s that! It’s also the most sparse box we’ve received, aside from the coupons. I’m contemplating taking a break from this box just because I’m drowning in samples, but I still think it’s an amazing way to exclusively sample drugstore brands. 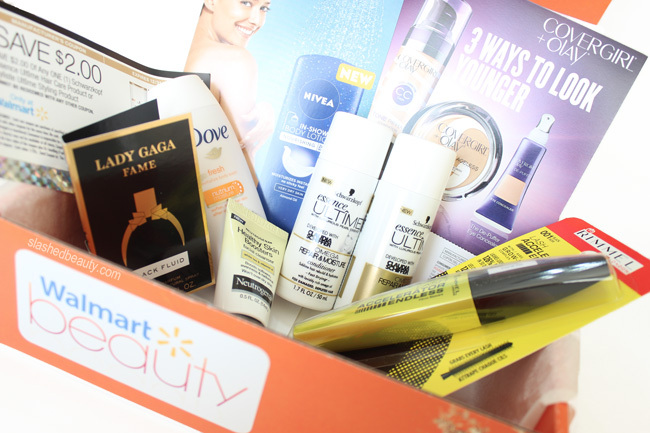 You can sign up for Walmart Beauty Box, which comes four times a year for only the $5 shipping fee online. This sounds amazing I wish our Walmart ( Canada ) did this. I love trying new things but sometime I find I big bottle of something is a waste when I’m the only one using them it would take me forever. It looks like you get good size products in the box, such a great post ! I feel the same way! I’ve got about 9 half empty bottles of hair product in my shower!